The new issue of This Is Fly dropped, and it’s great to see a feature on Dubai on the Fly make the cover. Frank Smethurst and I had the opportunity to sit down and talk about the experience of fly fishing in Dubai, and this interview is included in the issue along with many photos from Dubai. Big thanks to RA Beattie for capturing this photo of me with a mighty queen on the cover. It’s certainly a big surprise! It’s always odd seeing myself in photos, and I’m much more comfortable on the other side of the lens. And yes, the Off the Grid Studios team kept this from me as they know I would have protested! Ha — Thanks, team! Off the Grid Studios is pleased to announce the release of the full-length cut of their film “Dubai on the Fly.” Available now on Amazon channel and Vimeo, “Dubai on the Fly” is the culmination of two trips to Dubai in the United Arab Emirates by the Off the Grid Studios team.In “Dubai on the Fly,” Colorado angler Frank Smethurst joins Dubai-based Captain Nick Bowles and Emirati angler Mohammed Al Faour on a journey through the vibrant city of Dubai. Within the modern metropolis, the anglers encounter culture and tradition alongside skyscrapers and thriving industry. And while all enjoy exploring the city and the surrounding desert, the waters of Dubai are the main attraction, and queenfish are the specie of interest. “Dubai on the Fly” was an official selection of the 2018 Fly Fishing Film Tour and appeared in more than 170 cities, all while drawing widespread acclaim. 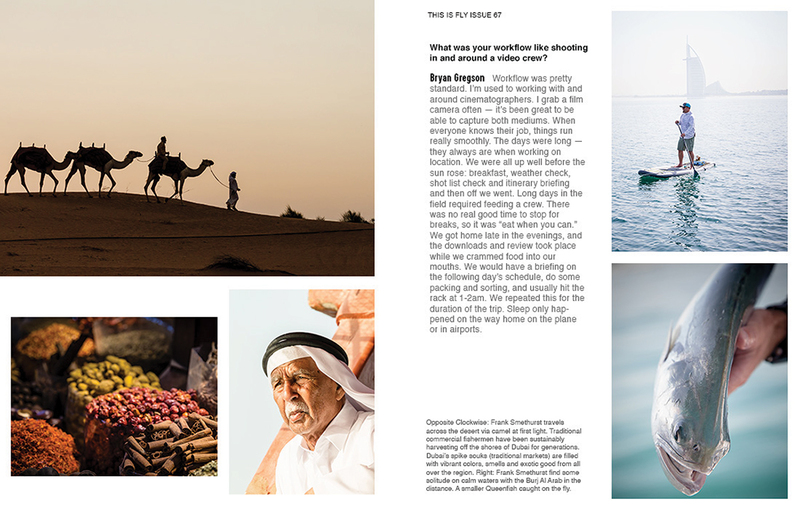 “Dubai on the Fly” received attention from numerous popular blogs as well as magazines Conde Nast Traveler, Fly Fisherman Magazine, Gray’s Sporting Journal, The Stonefly Magazine, The Mission Magazine and most recently with a cover shot and 14-page spread in This is Fly Magazine! Looking back over the past +1 year of production, one of Napoleon’s quotes rings true for this project, “Patience, persistence, and perspiration make an unbeatable combination for success.” This project was a tremendous amount of work but was equally gratifying. It would not be possible without the teamwork from such an outstanding group of dedicated people. Thank you all for lending your dedication, creativity, and passion. Here’s to the next round! The great attention to this film project continues with a new article from Sarah Grigg in Fly Fisherman Magazine. In the article, Sarah examines the fishing and culture of Dubai as well as our film project. Be sure to grab a copy at your local shop and read the full article. I’m thrilled to see my work from this trip make it to print in Gray’s Sporting Journal. Each time I think about this incredible adventure with this crew, it still seems surreal. What an amazing area — I had no idea places like this actually existed in reality. This was a journey I will always remember, and Dubai is a place I hope to return to.to return to. Be sure to head down to your local shop and grab yourself a copy of Gray’s Sporting Journal, or better yet, order a subscription. You won’t be disappointed. This issue is packed with great articles and some impressive photo essays — it is not one to be missed. I am pleased to announce the trailer for the 2017 Fly Fishing Film Tour film, Dubai on the Fly has just dropped. This is a film created by our collective group, Off The Grid Studios. It was great to spend time working with such an inspiring story with an incredible group of individuals. The tallest skyscrapers, the fastest cars, the fanciest restaurants and the most exclusive resorts and clubs. When westerners think of Dubai, fishing is about the last thing we imagine, if we think of it at all. But at the heart of this fast, modern city lies a shockingly intact traditional fishing culture alongside a budding fly angling industry. Acting as the Anthony Bourdain of this culture-and-recreation oriented film is Colorado-based angler and film veteran Frank Smethurst. Joining with Captain Nick Bowles and Emirati angler Mohammed Al Faour, Frank unveils familiar and unexpected sides of this iconic city, in the desert and on the water. This new media project, over two years in the making, will premier in the 2018 Fly Fishing Film Tour and travel the globe to festivals worldwide. The film will hit more than 140 cities in the United States alone.